Quick and Easy, the internal frame of the Reno Haven goes up in one day! Fifty degrees in the middle of January, good for Envirohaven, bad for skiers (we are skiers too so it’s of course bitter sweet)! Just when the cold weather gave out and the holidays came to a close, the prefabricated panels of our Reno Haven were insulated and receiving the final touches. Today we moved work outside and back onsite into the glorious sunny day, assembling the entire internal frame of our Reno Haven in just one short day. Each Haven package will have the same internal frame structure. This includes five 6”x6” glue lam posts that form a pentagon shape within the haven walls. These posts anchor directly into the foundation, connecting the internal floor plan and the roof into a solid foundation. Once these five posts are in place, five 6”x8” solid wood beams are bolted in between byway of Simpson brackets. 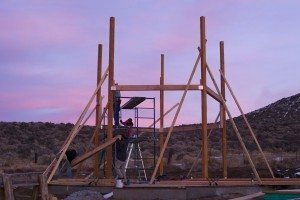 These beams provide stability for the posts, create a structure from which the second story floor can rest, and provide support for the triangle panels that will eventually make up with walls of the Haven. This simple structure consists of only ten pieces within a consistent and symmetrical design while providing an incredibly strong frame that anchors the entire internal support system into the foundation, from the exterior walls to the top of the roof. 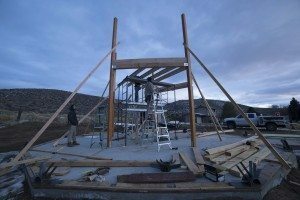 One of Envirohaven’s goals is to create a housing solution that is not only strong, efficient, and affordable, but that can be assembled quickly. Today showed us just how quick that process could be! 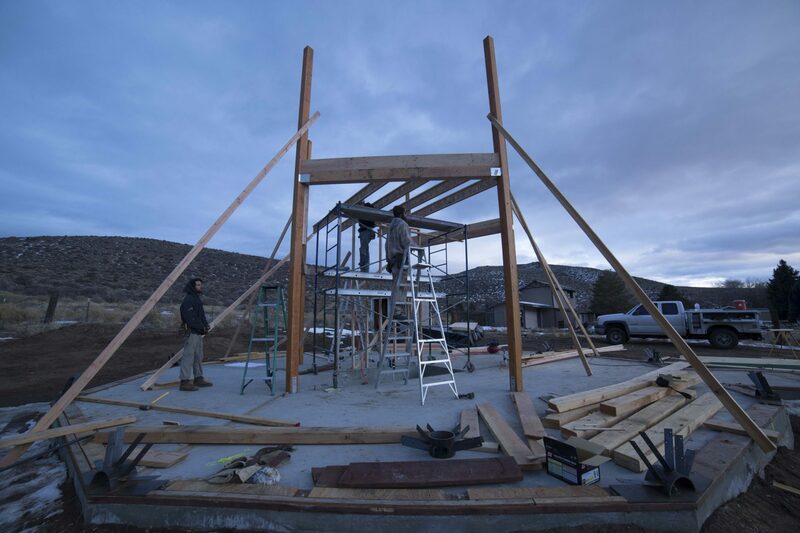 Stay tuned as we take advantage of this beautiful weather and start assembling the exterior panels in the next several days.